Wisps of hair blew around my face even though I was wearing a helmet. With knees slightly bent I stood on the platform of my gyroscope-balanced device, zooming in circles around large oak trees on the open grassy space. I was in a field beside Austin’s Lady Bird Lake doing figure eights on a Segway—and dodging four friends who came along on this crazy adventure. Riding free-form through the field, cutting fancy figures, and revving up as fast as we dared proved to be a favorite part of the tour. Yes, it really is that much fun! 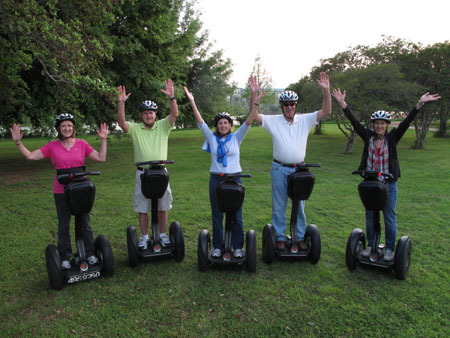 We had signed up with Gliding Revolution in Austin, Texas, and although my husband Larry and I had ridden Segways many years before, the others were novices. But it didn’t take long to learn basic moves for starting, stopping, and backing up. The rider’s body movements determine how the Segway goes: Lean forward and the device moves forward. Lean back, and that’s where you go. Your body is also the braking mechanism—stand up straight (with a slight booty tilt) to stop. Each little shift in position causes a change in motion and direction, but once you get the hang of it, you can glide along with minimal effort. After few minutes practice on the self-balancing transporters we were raring to hit the trail. Our group had opted for the Lady Bird Lake Tour, which explores an area near the urban lake and then glides through an eclectic 1920’s East Austin residential neighborhood. Although the lake was in view during the first half of the ride, we purposely avoided paths crowded by joggers and bike riders. Since we were on the evening p.m. tour, the last hour found us rolling in darkness past an area that’s developing into a favorite city night spot. Long-time residences on Rainey Street have been transformed into funky bars that attract a mostly young crowd, even on week nights, for music and drinks. It was a lively vibe not expected in this unfamiliar area. The guides were very helpful and made sure everyone could maneuver the Segway safely before leaving the training area. Along with leading us through beautiful natural scenery and a quixotically charming part of Austin, our guide shared bits of city trivia that made the tour interesting as well as fun. Even better, riding Segways is an earth-friendly way to tour a city. Visitors new to Austin might prefer the Segway City Tour, an historical adventure that glides through downtown, zips by the Capitol building, and takes in scenes along famous (or infamous) Sixth Street. During the summer, check out the Bat Watching Tour. At dusk, glide on Segways past Austin landmarks while watching Mexican free-tail bats fly on their nightly excursion from under the Congress Avenue Bridge. Additional food, bicycle, and kayak tours are also offered by the company. Segway tours last about two hours, and reservations are required. Call 512-495-9250 or click www.glidingrevolution.com for more information. The office is located inside the Holiday Inn on N. IH-35, so there’s plenty of on-site parking.